We’ll hold our monthly meeting on Friday, April 5, at 7:45PM, in room 215 of Davis Hall, the Aerospace Engineering Building. Riders from the Montgomery area are welcome to meet at the home of Russell Whigham, 518 Seminole Dr., and carpool over to Auburn. Our new moon star party this month will be on Saturday, April 6, at Cliff Hill’s farm. The W. A. Gayle Planetarium in partnership with the Auburn Astronomical Society will celebrate National Astronomy Day at the Planetarium in Oak Park in Montgomery, on Saturday, April 20th from 3:00 – 10:00PM CDST. Please let me know if you can come and help with your telescope. This is traditionally our best attended event of the year. We extend a special invitation to those of you who live too far away to attend most of our events to come and spend the afternoon and evening with us. Planetarium director, Rick Evans, is still working on a program. As always, AAS will offer telescopic viewing of the Sun, Moon, Jupiter, and binary stars following the auditorium presentations. 3:00PM: Early visitors will be able to view the seven-day-old Moon, and the Sun in the light of hydrogen-alpha with PST Solar Scopes and members’ scopes filtered white-light images. 5:00PM: The “Telescope Clinic” will be open for guests to bring their sick, disassembled, or otherwise malfunctioning telescopes for repair. 6:00 PM: Rodger Morrison will be the featured presenter, speaking on astro-imaging in the auditorium. 7:30 PM: "Tour of the Night Sky" (if time allows) in the planetarium, giving an overview of what the guests will see when they step outside. 8:00 PM: Telescopic viewing with Auburn Astronomical Society: Viewing Jupiter and of course the mountains and craters of the 11-day old Moon and several binary star systems. For those who have never attended one of our Astronomy Day events, you can get a feel for what goes on, by going to the “Field Trips” link from the Auburn Astronomical Society Web page then to “W.A. Gayle Planetarium Events”. And, here’s your Astronomy Day Checklist. If you’re bringing telescopes, let us know what type(s) and size(s). Rick needs a list of names for the name tags and a head count for refreshments. If you feel reluctant to bring your telescope because you think it’s too small, remember that most of the visitors will be more likely to consider one like yours for one of their own. If you don’t have a telescope, we always need help at the AAS information table where we'll have an e-mail sign-up sheet. We will also need someone to help keep an eye on the clock to point out satellite passes (times and locations will be provided) to our guests. If you are considering the purchase of a telescope, this is a good place to look and ask questions. If you have a telescope or accessories for sale, this will be the best place in town for your astro-yard sale. If you have some old telescope catalogs or magazines, the visitors are happy to have them. Be sure to bring a step stool or step ladder if you anticipate the little ones having trouble getting to your eyepiece. It's OK to ease your vehicle up the sidewalk to unload your gear. It would be nice to then move your vehicle out on the park road until the event is over. It’s a good idea to have a tarp to put over any cables or extension cords to prevent visitors from getting tangled and tripping in the dark. You'll probably want to bring a lawn chair, and don't forget your green laser -- always a hit with the guests. Many visitors will ask "What power is your telescope?". If you can't do it in your head, it's a good idea to print out a list of your eyepieces and their magnifications. Wear your AAS shirt if you have one. Still planned are our stargazes for May 18, Tuskegee Airmen NHS, and Jennifer Lolley is already planning for the next Forest Preserve fall stargaze on November 23rd. Rodger Morrison passed along a request from Jimmy Harris at the Lanark Foundation in Millbrook to have a Stargaze there in November as well. If comet ISON predictions hold up, we could have a full calendar next November. From Larry Owsley: The embedded video has a rendition of Curiosity's landing on Mars. Astronomy Magazine Article, IDA's great new light pollution video, "Losing the Dark." by David Eicher and IDA's Light Pollution Video. Brian Combs’ first image of Saturn taken this apparition. From the Smithsonian Website, what the night time sky of major cities would look like without light pollution on a clear night. From Robert Fuller on the CCAC Observatory: I met with Nick Nicholson on Saturday and took a look at the facility in Goodwater. The building needs work, but is structurally sound. The cover does roll back and there is an amenities room to allow sitting and such. There was a water collection configuration to run the toilet, but I am not sure it’s still functional. The two scopes that are there are beyond my knowledge to evaluate. I have pictures of them that I will set them up in a web folder for sharing tonight when I get home. Outside of the building is rather flat and is at approximately 900+ feet elevation and has almost a 360 degree view. I have pictures of the panorama and will place those in the same folder. I will send a link when I have it set up. My only concern is the way up. It is a steep incline that will need some repair. I am not sure the way is safe as it stands now for a rear wheel drive vehicle. I was able to climb it in my Jimmy, but in the dark it wouldn’t be advisable. On both of counts of the building and road, Mr. Nicholson thought it could be easily corrected. Over all I impressed with the scope of the view. There doesn’t seem to be a taller mound to block the view and the area could easily hold several hundred viewers. The facility is on private property and CACC might not be a player in its use. I have spoken to the son of the property owner and he has no problems with using it. I would of course get that in writing or at least an email first. If you are going to be at Saturday’s party we can discuss it there if you would like. Well, this one pretty much lived up to its advanced billing and an incredible response to my call for reports — too many submissions to include here, so this comet gets its own Web page. From the AAS homepage, select “Astrophotos” then “Comet PanStarrs”. Thanks to: Scott Cook, Frank Ward, Russell Whigham, David King & Lucille Beardsley, Joe Champion & Lauvone Turner, Rodger Morrison, Robert Fuller, Johnny Bergmann, John Howard, and Scott Thompson for their images and descriptions. 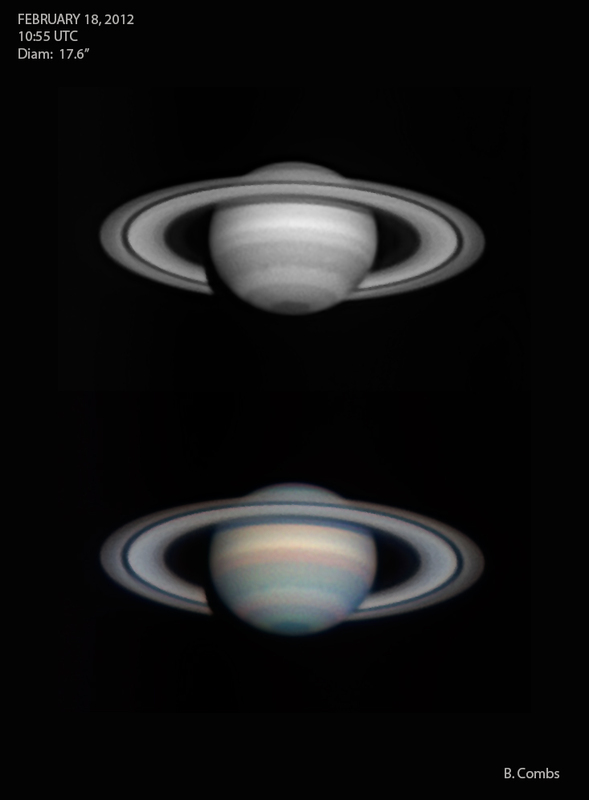 While you’re at the “Astrophotos” page, check out Rodger Morrison's Astro Images.